It’s not as hard as you think! Learn to block confidently so your pieces look perfectly finished. You will feel as though you have taken your knitting to a new level. We’ll talk about the tools you’ll need, different techniques and when and why to use them. Then we’ll practice together. 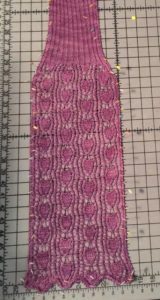 none required, however, if you would like to practice blocking in class, feel free to bring in a 5-8 in swatch in a texture or lace pattern of your choice, blocking pins and a hand towel (or small foam board specifically for blocking).